The traditional pharmacist role as dispensing medications across the counter/Over the Counter (OTC) has evolved over the years. The pharmacists have, over time, traditionally leveraged their clinical knowledge to review prescribed drug regimens which help prevent inappropriate dosing and have been instrumental in minimizing drug interactions. Pharmacists are placed second only to nurses in terms of professional ethics and honesty (as per the Gallup Poll, 2013). Moreover, the U.S. Bureau of Labor Statistics (BLS) projected employment of pharmacists to grow 14 percent and employment of pharmacy technicians to grow 20 percent from 2012-2022, however dependent on the healthcare industry and economic markers. The trend may look even more positive, given their role in the new healthcare reforms initiated in November 2015 – providing direct care to patients as members of integrated healthcare provider. The Affordable Care Act (ACA) or otherwise known as the Obamacare Act of 2010, main goals are to reduce healthcare costs and improve the health of the population. Integrating pharmacists, who represent the third-largest health profession, into such systems has now become even more important for achieving the intended goals. By giving the pharmacist the opening to now provide direct care to patients, readmissions into hospitals can be kept low and the pharmacist can now provide medication via Medication Therapy Management (MTM) services that can result in improving outcomes and reduce healthcare costs. It is a known fact that nearly 81 percent of adults often prefer to self-treat their minor ailments with OTC products, and pharmacists are the ones they usually turn to, to help select the right ones. Pharmacists have the professional expertise to address key challenges facing the health care system, especially patients who have multiple chronic conditions such as heart disease, stroke, cancer, arthritis, hepatitis, and asthma, a fact that is increasing in the United States, and almost half of U.S. adults—approximately 117 million people—have at least one chronic disease. It is a given fact that most people who have more than one chronic disease do take multiple medications to manage their conditions and related co-morbidities but are also known to hardly receive any follow up care. The consequences of such a low or non-adherence to medication therapy can be serious, including medical complications, increased healthcare costs, and/or even death. Pharmacists typically provide the above services in interdisciplinary teams through collaborative practice agreements (CPAs). 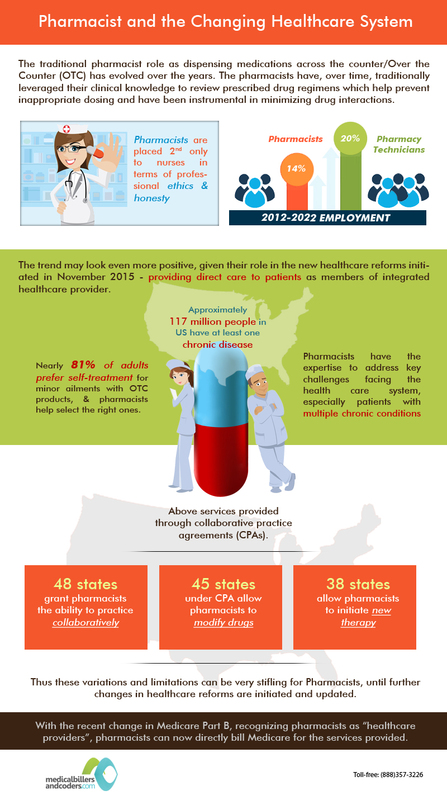 Although 48 states grant pharmacists the ability to practice collaboratively in some capacity with other healthcare providers, administrative barriers and lack of flexibility limit pharmacists – state laws and regulations place limitations on practice settings; variation in authority to initiate or modify drug therapy – 45 states under CPA allowed pharmacists the ability to modify drugs, whereas 38 states allow pharmacists to initiate new therapy; limitation on the number of patients permitted within a CPA; imposition of extra requirements for education and training before pharmacists can be eligible to participate in a CPA; requirement of pharmacy and medical board approval for each CPA, etc. Thus these variations and limitations can be very stifling for Pharmacists, until further changes in healthcare reforms are initiated and updated. Another opening where pharmacist are playing a pivotal role is as part of the Accountable care organizations (ACOs), which manage the entire patient care and have started to integrate pharmacist-provided medication management to improve medication adherence and clinical outcomes, and thus potentially reduce costs. Pharmacists are already providing care in several areas – Preventive Services (Screening and Immunization); targeted counseling in ambulatory/outpatient settings, post-hospital discharge, and community pharmacy settings. With the recent change in Medicare Part B, recognizing pharmacists as “healthcare providers”, pharmacists can now directly bill Medicare for the services provided and thus this seems to have shown a glimmer of light for the pharmacist and recognition of the services to the community at large. This entry was posted in Healthcare Reforms, Infographics, Pharmacy, Pharmacy Billing Services, Pharmavy Billing Services. Bookmark the permalink.